I used Happy Halloween Fhiona for my image. I LOVE HER!!! My dots are the embossed dots on the purple panels, the bats are from the Martha Stewart bat punch, and the tag was cut with my Spellbinders Tag Trio. I will leave a full recipe below : ) Thank you so much for stopping by! 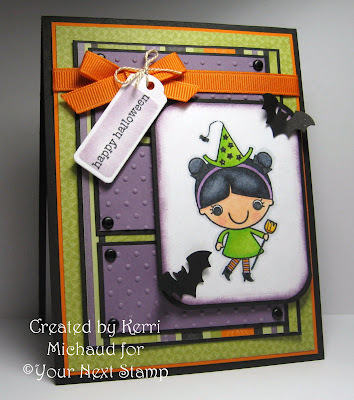 kerri...what a flippin' cute halloween card! love the colors, the do, the sweet image, and the bat accents...LOVE IT ALL, GIRL! I don't know how you do it....but you can pull off layers and all that, but still make an awesome CAS card, too. Multi-talented, I guess! This is a darling Halloween card. I love the little bats, and all of the papers that you used together. How cute! Very festive and great layout. Now that is one stinkin cute witch!!! Great layout - I love it! Well Kerri, I'm not much into Halloween, but this one makes me smile! She is sooooooooo adorable!! Great colors and textures, bow, bats and coloring job girlfriend! What a fab image - a great halloween card! A fantastic Halloween card thanks so much for joining us at the Pink Elephant. Hope you'll find time to play with us again next week and good luck with the prize draw. What an adorable card! I love the tag and way how you attached it! Very nice layout and papers! And what a cute touch with the bats! Hi Kerri, I love this adorable and cute Halloween card. OH MY Kerri what a cute cute image!!! I knew you would dooooo amazing cards with these sweet stamps....So sorry I have been MIA Have had a very busy couple of weeks....So glad to get back in the groove some!!!! LOVE your card girl!! Hugs! Oh my goodness!!! I really love this design, image, coloring, embellies, etc. Now you are making me want to go and get that MS bat punch...tooo Darn Cute Girl! Hope all is well with you and yours! YOu did an incredible job with Mercy's sketch!! I love your colors, design, embellies and adorable image!! She is a really cute girl - - right up there with Anya. Love the purple in this...and your little popped-up bats are really cute! This is SO pretty Kerri! Love all the layers of DP! She is such a cutie and I love the little bats! What a super duper card Kerri!!! Love it!! Thanks so much for sharing this week at The Pink Elephant!!! Super cute card Kerri!! Thanks for playing along with us at The Pink Elephant this week!! I absolutely adore this card!! All the colors and textures are wonderful and your coloring is perfect! Also the bats are the perfect touch!